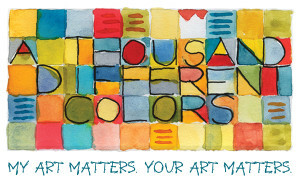 A Tho usand Different Colors is a local creative community beginning in Powhatan, Virginia ~ for artists and creatives of all genres, beginners and professionals, we believe your art matters. We believe creativity in community is the way, and so we build a community in which to be safe, inspired, learning, growing, supported, and making a difference in the world. We create, and support venues where local artists can share their art and how they make it. Writers, craftsmen, musicians, sound & lights engineers, actors, dancers, dreamers, woodworkers, designers, poets, painters, sculptors, jewelry makers, gardeners…amateurs, professionals, beginners, hobbyists…together we are A Thousand Different Colors. A Creative Community Night is an event where local artists and creatives show their work for a supportive audience. It’s not a performance, but an evening to share creativity and a bit about the creative process. Click here for upcoming events. Do you want to know more? Thinking about becoming involved? Contact us here…let us know about you. What’s your creativity? How have you used your talents in the past, what are you doing now, and where do you hope to go in the future? Where do you get stuck, and where are you happy with your progress? Click here to join our email list…we’ll keep you updated without clogging your inbox. And you can always send an old-fashioned email to: info at AThousandDifferentColors dot com.